A new long-acting contraceptive patch that women administer themselves could eventually provide a new family planning option, particularly in developing nations with limited access to health care. 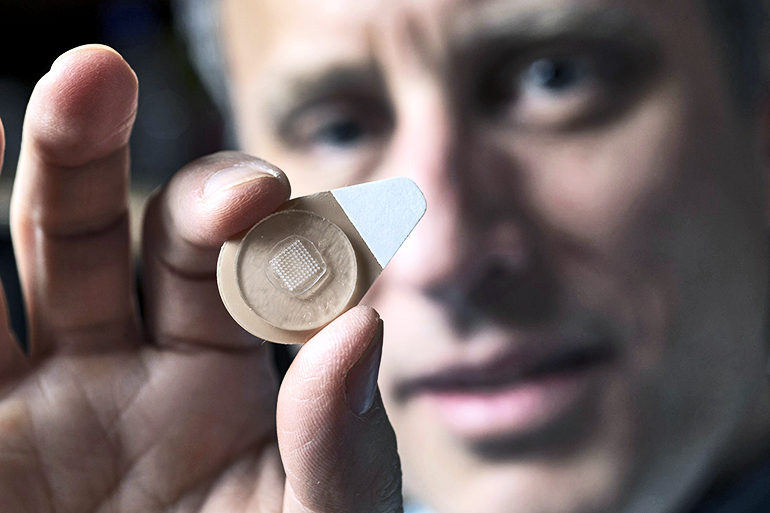 The patch uses microneedle technology originally developed to painlessly administer vaccines. Long-acting contraceptives now available offer the highest level of effectiveness, but usually require a health care professional to inject a drug or implant a device. Short-acting techniques, on the other hand, require frequent user compliance and therefore are often not as effective. In animal testing, an experimental microneedle contraceptive patch provided a therapeutic level of contraceptive hormone for more than a month with a single application to the skin. When a woman applies the patch for several seconds, the microscopic needles break off and remain under the surface of the skin. Biodegradable polymers slowly release the contraceptive drug levonorgestrel over time. Long-acting contraceptives are now available in contiunous-wear patches, intrauterine devices that health care professionals put in place, and drugs injected with hypodermic needles. 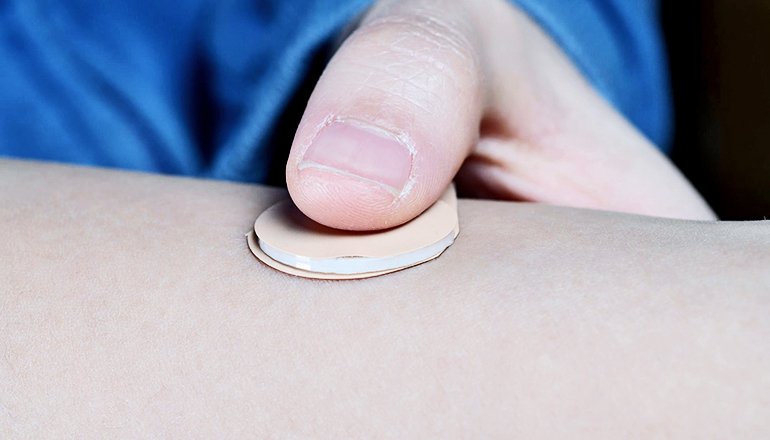 If the microneedle contraceptive patch is ultimately approved for use, it could be the first self-administered, long-acting contraceptive that does not involve a conventional needle injection. Like other long-acting contraceptive techniques, the microneedle contraceptive patch would disrupt a woman’s menstrual cycle. Because the tiny needles must remain in the skin for the time-release of the hormone, researchers developed a mechanical technique to allow the drug-containing microneedles to break free from the patch’s backing material. Tiny molded air bubbles in the top of the microneedles create a structural weakness that makes the microneedles strong enough to press into the skin. When the patch shifts to one side, shear force breaks off the tiny structures and the patch backing is discarded. Researchers have developed, but not yet tested, experimental patches designed to deliver a sufficient amount of the hormone for humans, says Prausnitz, corresponding author of the paper, which appears in Nature Biomedical Engineering. Researchers are also studying whether a single patch could carry enough hormone to provide contraception for as long as six months. Researchers used a blend of biodegradable polymers, poly(lactic-co-glycolic acid) and poly(lactic acid), commonly used in resorbable sutures, to mold the microneedles, says Steven Schwendeman, professor in and chair of the pharmaceutical sciences department at the University of Michigan and a collaborator on this project. Lactic and glycolic acids are present naturally in the body, contributing to the biocompatibility of the polymer material, he says. “We select polymer materials to meet specific design objectives such as microneedle strength, biocompatibility, biodegradation, and drug release time, and formulation stability,” Schwendeman says. Testing with rats evaluated only the blood levels of the hormone and did not attempt to determine whether it could prevent pregnancy. “The goal was to show that we could enable the concentration of the levonorgestrel to stay above levels that are known to cause contraception in humans,” Prausnitz says. Researchers leveraged earlier work on dissolving microneedle patches designed to carry vaccines into the body to develop the patch. Researchers conducted a Phase I clinical trial of influenza vaccination using rapidly dissolving microneedles with Emory University. That study suggests that the microneedle patches could safely administer the vaccine. Because the microneedles are so small, they enter only the upper layers of the skin and aren’t painful, study participants report. The contraceptive patches tested on the animals contained 100 microneedles. Researchers have made a larger patch, necessary to deliver an adequate dose of levonorgestrel to a human, but have not tested it. They would like to develop a patch that could need application only once every six months. Additional researchers from Georgia Tech and the University of Michigan contributed to the work. The Family Health International, funded under a contract with the US Agency for International Development, supported the study.